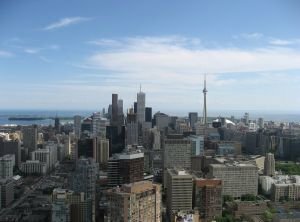 "The already expansive price gap between condos and detached housing in the Greater Toronto Area (GTA) will continue to expand towards the end of the decade as new detached development is squeezed against the walls of the protected Greenbelt and overwhelmed by mature millennials looking for backyards. That’s according to a new study from the Bank of Montreal examining how changing supply and demand dynamics will shape housing in the GTA. While many point to the rapid build-up of condo inventory as reason to believe Toronto’s market is approaching bubble territory, BMO senior economist Robert Kavcic says those people are ignoring a fundamental shift in where Ontarians will live in the next decade. The gap between the price of a new house and a new condo in Toronto skyrocketed to nearly $300,000 in February. Carras says “moving out to the burbs” is going to mean travelling to more far flung areas of the province as a wave of higher prices radiates from Toronto’s city centre." Source: Jeff Lagerquist, BNN / BMO / RealNet Canada Inc.